No I’m not talking about the impending holidays; they’ve been in full swing for weeks now. I mean it’s barely mid-November, we’ve not had a hard frost yet, and already I’m getting notices urging me to nominate stories and novels for various awards–Hugos and Nebulas most prominently. Grumble. Sigh. Make no mistake, I do appreciate my friends and fellow writers letting me know what they’ve come out with that is award-eligible, and I fully intend to make nominations in various categories, but there’s a month and a half left in 2015, during which time, there will be plenty of good new stuff coming out. To say nothing of the fact that my To-Be-Read pile is threatening to topple and bury my electronic devices containing yet more unread prose. 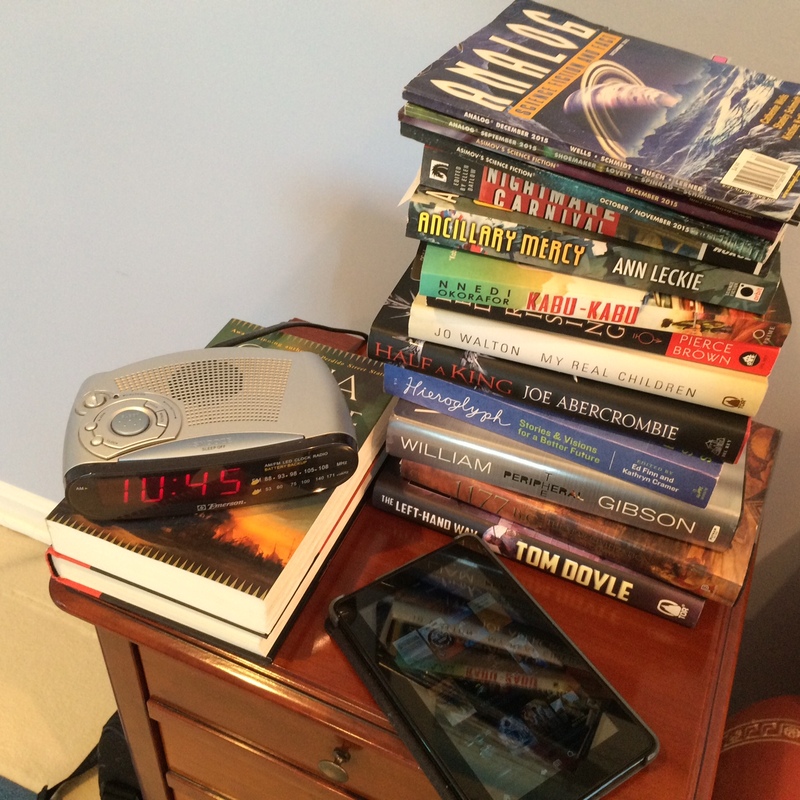 I’ll blog about some stories and novels I quite enjoyed this year, but not until I get that pile under a little more control. Maybe next month. More likely January. Even so, I love receiving the notices. If nothing else, they’re a terrific reminder of how much a number of my friends have achieved in an extraordinarily competitive field. I’m proud of every one of you! As for me, the stories I sold this year won’t find their way into print until next year. I did have two guest editorials published in Analog (The Future Is Prologue and Conspiracy Theories for Everybody), but nothing in the fiction categories.